For three years before this one, I celebrated July 31st with a friend who loves Harry Potter much like I do. After moving to Utah, I was sad about not celebrating with her, but I found friends here who love Harry Potter too. In previous years, I’ve made chocolate cake with fleur de sel caramel filling, but this year, I decided to try a snitch cake. 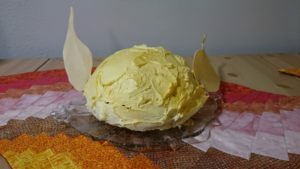 I found a hemisphere cake pan, edible gold spray paint, and edible paper to make the wings. I made chocolate frogs, butterbeer, and a beef stew worthy of Molly Weasley. Friends came over, some with wizarding accessories, and we read tea leaves, did trivia, and watched Half-Blood Prince. Everyone got into it, which made it fun.